"I wont be forgetting you any time soon!" I said. And I was still holding her tight. Something about her was different. I didn&apos;t want to let go. I had never felt this way about any other fan. Except for Sarah. And even her I didn&apos;t feel this kind of connection. But I need to brush off this feeling. I stand back up but this time I put my arm around her shoulder. "That&apos;s good, I don&apos;t want to loose you after I just met you" (Y/N) said. "Yeah" I said scratching the back of my neck nervously. "Lets get out of here" I said as I led her out of the dark building. When the light hit her face I was amazed. She was so much more beautiful from when I had seen her in the building. I tried not to let it get to me. We walked to her mom who was standing recording us. "Aw, love birds already!" (Y/N)s mom said. (Y/N) blushed and hid her face trying not to let me see. It was adorable. "Mmmooommmm" She groaned. She was so cute and annoyed. "Mrs.(Y/L/N), Could you please not post that on any social media, I wouldn&apos;t want (Y/N) to get any hate from that" I asked as politely as I could. She agreed and told us to get going while handing (Y/N) her suitcase. I led her to the car, my arm still over her shoulder as I opened the passengers side door for her and she hoped in and buckled right before I had even gotten in the car. I got in and she was looking out the window. I buckled and turned on my panic cd and the first song was Death Of A Bachelor. Her eyes lit up when she heard it. She blushed as I started singing to my own voice. Soon she caught on and slowly started singing to. By the time we got to my tour bus we were both jamming out to my music. "Wow, Your a great singer" I said and got out of the car. I could tell she was blushing without even looking at her. She got out of the car and followed close behind me. I was close but still behind him cuz I was blushing like crazy from what he said. We walked in the bus and I was expecting the rest of his band to be there but instead it was empty. "Brendon, where is everyone?" I asked "They have their own bus. Im in one bus and there in another." He said. I was surprised. He showed me around the bus and we decide to just sit and talk on the couch. I sat down and he sat pretty close to me, which made me blush. "Wow, you really blush a lot don&apos;t you cutie" He said which made me blush even more and I ended up burying my face into his chest without thinking. She was blushing so much! It was so adorable. She buried her head in my chest and my heart sunk. But she just stayed there. She didn&apos;t seam to want to move. So I gathered up my courage and I kissed the top of her head. She nuzzled up against me more but then I peeked out the window and saw her two other surprises peeping in the window. They both barged in and started screaming. "GO BRENDON" and "WOOO KISS HER BEEBO" I blushed and when (Y/N) saw them she screamed. Omg. I couldn&apos;t believe my eyes. Brendon had kissed my head and then all of a sudden Josh and Tyler come barging though the door screaming at us. So my natural instinct was to run to my bunk, jump in and close the curtain. "(Y/N), can you please come out? We didn&apos;t mean to scared you" Josh says in a soft low voice knocking on the siding of the bed. I just sit silent as I hear Tyler and Brendon walk over to Josh. "(Y/N), please, were so sorry. Please?" Tyler now said in a softer voice. I was now tearing up wondering how this was all happening to me. The good just kept coming. I started off depressed and un-loved, then happier knowing Panic, then barley depressed knowing Brendon, then not depressed at all meeting Brendon, then overwhelmed when he kissed me, then out of my mind when Josh and Tyler show up. "(Y/N), please. Im sorry, this was my idea to invite them on tour. Of Course I wasn&apos;t planning them to walk in screaming like that but still. Im sorry. Please come out and let me see that beautiful face of yours?" He asked putting his hand through the curtain expecting me to grab it. I hesitated, but then I grabbed it. With his other hand Brendon opened the curtain and helped me down. He hugged me tight and I buried my face in his chest scared to face Josh and Tyler. Brendon lifted my head towards his and I was really shaky. "You ok now?" he asked and I nodded slightly. I could see Josh and Tyler sitting on the couch just staring at us in awe. I blushed and walked over to the couch with Brendon and I sat in between Tyler and Brendon, Brendon&apos;s arm over my shoulder, and I was blushing laying my head on Brendon&apos;s shoulder. "Well, I didn&apos;t know Beebo had a girlfriend" Josh said winking. Tyler and Brendon were blocking me in so I couldn&apos;t run off again so I just hid my face in Brendon&apos;s chest. "Josh, stop, you know she&apos;s not my girlfriend. She&apos;s shy and scared. 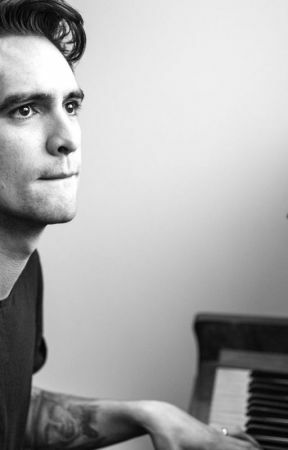 So please stop with the jokes" Brendon said. "Dang, ok, sorry (Y/N). 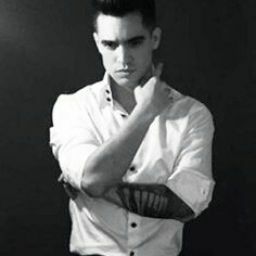 I was just trying to tease beebo over here. I wasn&apos;t thinking. I thought you were all settled." Josh says. "W-we-well I-I k-kinda w-was, I-im jus-t a bit shocked. I was c-calming do-own until you guys barged in like that." I managed to actually tell them. I was so scared but I knew I couldn&apos;t stay silent forever. It just wouldn&apos;t be a fun year.